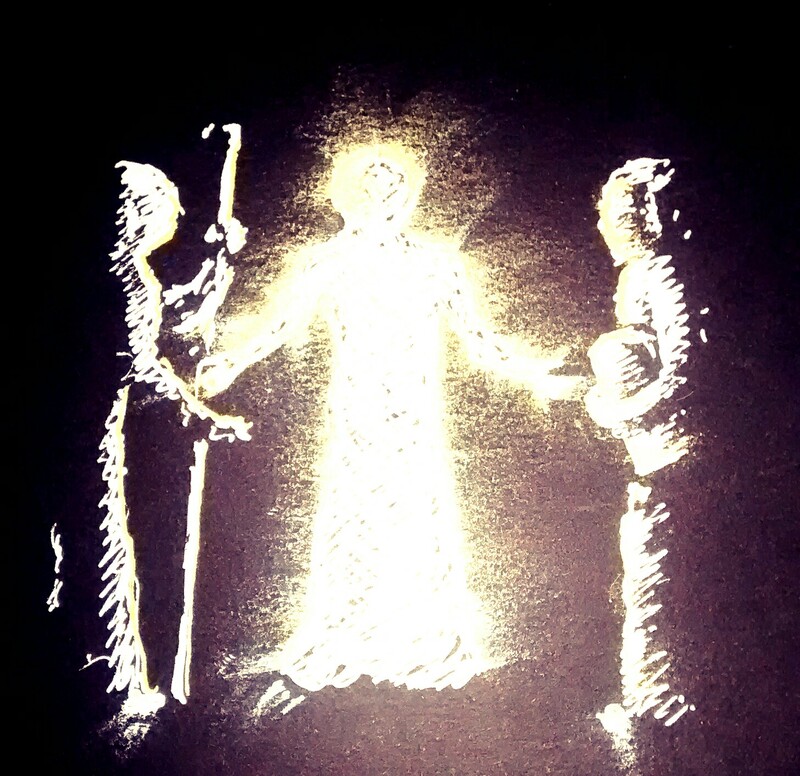 Getting ahead of myself a bit – here is a doodle for Sunday’s gospel, the Transfiguration. I used white and gold metallic pen on black card, then took a photo of it with the flash on (just on my phone) – because of the black background, the flash really lights up the highest concentration of ‘shiny’ gold and white, hence the reddy-brek glow effect! Also, with the pens I’m using you can smudge them before they dry, so I blurred the edges a bit. I’m glad you liked the doodle – it was fun to do. Ally, would it be OK to use the image for the projector slides for our Children’s Eucharist on Sunday please? I’ve yet to work out what to say about the scripture to a bunch of kids of primary age, but the image would be a start. I’m doing all age this Sunday, with this reading, and I’m going for the ‘awe and wonder’ approach – I picked some images of rainbows, sunsets, starry skies, mountains etc and thought we’d do some wondering and imagining and remembering the most beautiful, awe-inspiring things we’d ever seen as a way in to think about the idea of Jesus’ transfiguration giving us a glimpse of heaven – and then focus not so much on how Jesus was changed, but how the experience of glimpsing heaven changes us and how we see the world and each other. Not sure if that helps! Thank you, it might. Need to get my ‘lifting the veil’ adult sermon out of my head first. I have to get the weekly tasks to queue otherwise I get confused. I shall return here later in the week. You are such a blessing to folk Ally, thank you. You’re so welcome – I hope whatever you decide to do goes well and I’m sure it will be a blessing to your congregation (adults and children alike).